Need a willingness to learn! This course will teach you everything you need to know about UX, including design, content, and coding. And you’ll learn from the ground up, so it doesn’t matter how much experience you have when you start. This course will help you stand out as a web designer, teaching you how to apply User Experience (UX) strategies that will make every site you build useful, usable, and valuable. Reinforce what you’re learning using the bonus 30-page downloadable UX Guidebook. Filled with exercises and activities, the UX Guidebook is a great tool to reference as you progress through the course, or while developing your own custom sites. You’ll also get hands-on experience designing and coding three different types of sites. This will give you the confidence to pursue similar projects if you’re already a website designer, if you want to get into web design, or if you want to enhance your current business site. Even if you’re a complete beginner, this course will show you how to make a website functional, attractive and successful. It will walk you through all of the steps required to enhance the User Experience on any site, right down to the code, content, and design. You’ll begin by defining who your website users are and what they expect from the website. You’ll also learn how business goals — yours or your client’s — have to be uncovered and addressed for site success. You’ll learn what questions to ask both groups, and you’ll use the answers to inform your content and design decisions. Next, you’ll dig into Information Architecture (IA), which looks at the content on your website, how you should categorize it, what you should call it, and more. This will lay the foundation on which you can further build out your website to make users flock to it, stay on it, and hopefully make purchases. Plus, you’ll tackle how to design your website depending upon who your visitors are, whether your website is B2B (business-to-business), B2C (business-to-consumer), or an ecommerce site for selling products online. Different audiences have different needs, so learning what your target user expects from your sitemeans you’ll be able to design and build a site that meets those expectations and leads to greater conversions. In addition to knowing what you need to put into your website to make it stand out from the crowd, you’ll also learn how to identify and remove UX- and UI-related obstacles. The ability to see and solve these problems will ensure every website you build moving forward will be useful, usable and valuable to the people who use it. Most importantly, you’ll then learn how to actually build and code these types of sites using HTML, CSS, WordPress, and more. You’ll not only know how to effectively design B2B, B2C, and ecommerce sites, but you’ll also know exactly how to develop these sites, from start to finish. By the end of this course, you’ll have an in-depth understanding of UX and web design, as well as the tools to develop a variety of sites with the right code. 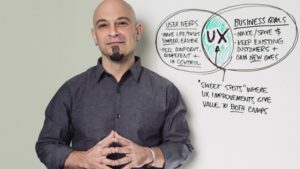 You’ll know why UX is so important to both users and businesses, what content is needed on a site, what UI design is appropriate, and how to transform your vision into a fully functional website using the most effective tools available.